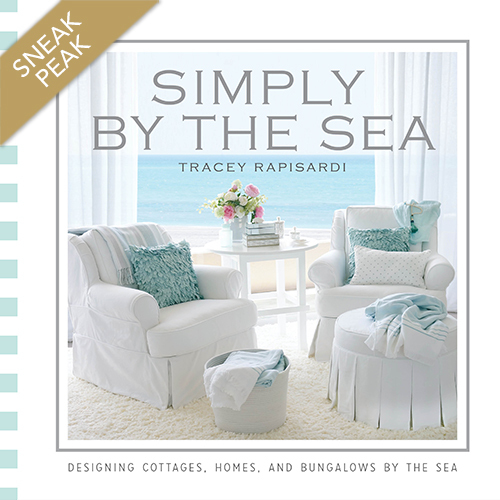 Simply by the Sea by Tracey Rapisardi shares the magic and charms of living by the water. Filled with homes and lifestyles stretching the coast from Maine to Florida, these pages are filled with the seaside homes of your dreams. In addition to the sea glass blue and palm frond green palette, comfortable interiors welcome family and friends at these stunning coastal retreats that sit along the natural beauty of the coastlines. You’ll practically feel the breeze coming off the water at each turn of the page. Those who are lucky enough to live by the ocean as well as those who dream of it will find various styles and endless inspiration through gorgeous full-color photographs on every page. Whether it is cottage, classic, modern, vintage, farmhouse, or country, these stunning spaces bring beach living to you. So, relax and be inspired by Simply by the Sea. Bound with a ribbon bookmark, Simply by the Sea makes a wonderful gift. Tracey Rapisardi is an Interior Designer with more than 30 years experience in interiors, architectural design, styling, fabric / accessories design and furniture design. She is a nationally and internationally featured Interior Designer who has been published in over 75 publications including magazines and books. Her unique style is coveted by thousands of homeowners. Preorder Today! Available April 1st, 2019.